We're Awakening! : Jon Foreman is "Restless"
For more "Vice Verses" news and all other informational tid-bits, head over to our New Album page to get your fix! "The Beautiful Letdown" turns 8 today! "Needle and Haystack Life" on Hawaii Five-Oh! Switchfoot coming to Sydney, AUS on April 21st! "Vice Verses" track listing posted! 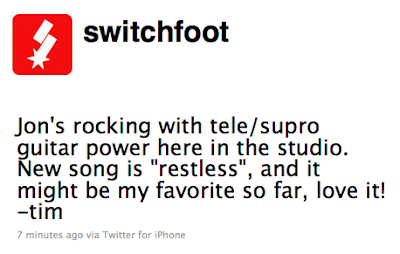 Switchfoot wins their first Grammy Award! "Selling the News"; Drew making "Vice Verses"